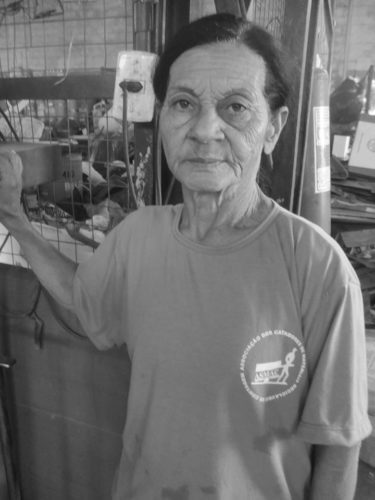 Born in 1953 in Pescador, Brazil, Marlene comes from a big family: she has 10 siblings, 7 women and 3 men. All of them are alive – a blessing since child mortality used to be considerably high in the inner parts of Brazil. Her mother is 86 years old and her father died in 2014. Marlene studied in her hometown but did not finish high school. Despite that, she worked as a substitute teacher for a while in schools in the rural area near her hometown covering tenured teachers when they were on holidays or attending external courses. This was in 1971 and she received the minimum wage but did not have any written agreement with the school. Marlene thinks of herself as a lucky person. Her mother was a seamstress and her father a merchant. Some of her sisters managed to conclude high school and even an elementary course on pedagogy and left her hometown to work in Belo Horizonte, the capital of the province where she is from. All of her family progressively moved to Belo Horizonte and so did she. Marlene did a course on dactylography and worked as a secretary. She later worked as a salesperson in a store in the city centre. In 1978, she got married having had 5 kids in the following years. Her husband was an electrician and moved town a lot taking the family with him. Thus, Marlene has lived in various cities in the province of Minas Gerais. She eventually returned to her hometown, where her father-in-law had been mayor for five mandates since he promised to find her a job there. However, he never did so she pushed her husband to move back to Belo Horizonte. Bringing up 5 kids, she had several different jobs. Around 1996 she started working as a waste picker at the central food supply centre of Belo Horizonte. She would reclaim recyclables as well as vegetables. She remembers that middlemen used to pay peanuts for the materials. Some of the merchants that worked at the supply centre became friends with Marlene and started donating food that would be otherwise thrown away but that was still suitable for consumption to her. She says that a lot of food is wasted at the supply centre what is a shame. In 2000, the managers of the supply centre forbade the presence of waste pickers and hawkers in its premises. She was desperate, but the Street Pastoral, a voluntary group of the Catholic Church, gave her hope helping waste pickers to get organised and set up an association. That is how ASMAC was born. Marlene is extremely thankful for the support voluntaries and missionaries gave to her and her comrades. She is currently the general coordinator of ASMAC, having worked as treasurer and as weigher. When asked about her dreams, Marlene says she would like to have been able to finish her studies and become a teacher. This is our comrade Marlene from ASMAC. Fotos e entrevista de Gilberto Chagas MNCR.